John Sprackland retained the SWAC Fell running Grand Prix at Cilcain with a strong run finishing the Grand Prix series with a maximum 40 points. 5 SWAC runners joined a field of 159 runners on the start line outside the church in Cilcain village for the race up and down Moel Famau a climb of 1200ft. The race started with a fast downhill road section, which the runners had to run back up on the return to the finish. Once off the road the course joined the track which climbed steadily before starting the steep climb up the narrow zig zag path which takes the runners, in single file, up to the main path leading to the summit of Moel Famau. Despite the rain of the previous day, the course was still dry and firm making for fast running conditions. From the summit the race followed a different route dropping sharply down the fell side before climbing gradually before another steep descent to join the path back to the village. It was a shock after having run downhill for over 2 miles to face the strength sapping uphill road section to the finish outside the church in the village. John Sprackland was first home for SWAC in 39.43 a good distance ahead of Brian Davey in 44.24, followed by Clive James and Billy Hargreaves was fourth man home. Michelle Spencer was the only lady runner from SWAC running well after having completed the Kong MM the previous day. Apologies to Clive, Billy and Michelle, unfortunately due to a timekeeping error, all the official results and times are not available at present. Congratulations to both John and Michelle on retaining their Grand Prix titles and we look forward to the 2019 series. 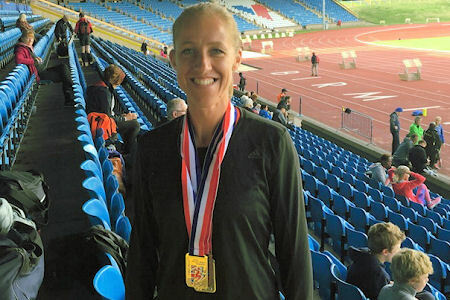 This weekend was the England Athletics U15 and U17 Championships in Bedford and the British Masters Championships in Birmingham. In Bedford we had 4 of the 6 qualifying athletes performing in some difficult conditions, Saturday was cool, with a breeze but little rain. 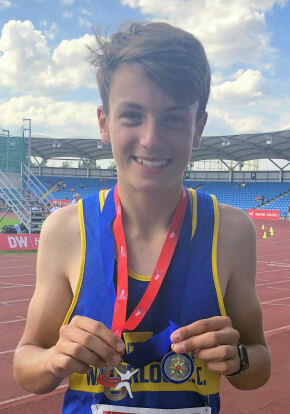 Sam Coupland was first in action in the U15B pole vault on Saturday morning clearing 2.98cm in a competition that lasted over 3 hours finishing 12th. Josh Stammers next in the U15B 300m, running in a difficult outside lane in 40.35s, 6th in his heat. Joe Kane was last to feature on Saturday in the U15B 100m. The best performance of the weekend equalling his PB with 11.60s finishing 5th in his heat. Sunday in Bedford was wet, and got wetter... it was also very cold. Sam was high jumping and though his best clearance of 1.67m isn’t what he hoped, he beat some very talented jumpers for 7th place. Joe was also back for the 200m, 4th in his heat with 24.46s just missing out on a final. As the weather worsened Steph Robertson featured in the U17G 80m hurdles, 7th in her heat in 14.1s. Finally, Sam was back this time on the track for the U15B 80m hurdles, finishing 5th in his heat in a time of 12.51s. Birmingham was a fantastic setting for the British Masters Championships. Athletes competing in age graded groups aged through to v95. We had 4 club members taking part with Milly Smith busiest in action over both days. Milly took on three events on Saturday, starting with the high jump, finishing 3rd for the bronze medal with a clearance of 1.35m. The sprint hurdles next, in a PB of 14.25s, to win the event and a championship gold medal. She wasn’t finished! The final event of the day for Milly was the long hurdles finished in 75.79s and another title and gold medal. On Sunday, the rain that was causing havoc in Bedford also reached Birmingham. Milly returned but with company as Katy Coupland, Clare Constable and Ian Fitzpatrick were also representing our club. Milly was first in action in the javelin. This took place outside the stadium in what looked like a swamp. 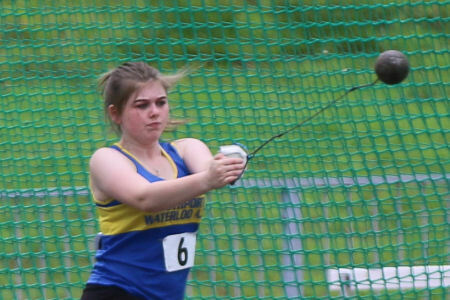 Nevertheless, Milly won this event with a throw of 21.82m, gold medal just reward for having no feeling in her hands... Katy threw Discus in a good competition also hampered by the weather her best of 26.68m was good for 3rd place and a bronze medal. Clare and Ian were there for the 800m with Clare first on track leading from the gun, finishing first in 2:23.87 for the championship title. Ian was in the final event of what had been a very busy Championships. His race was very popular and Ian finished in 2:21.84 for 7th place. Congratulations to all our medalists who now appear on our clubs roll of honour page. (Updated 26th August, noting Ellie Clark's club discus record) 19 of our athletes attended the Mid Lancs Medal Meeting at Blackpool on Saturday, ending the day with 13 PBs, and an improved club record for Harry Flanagan. The weather turned a little chilly in the on-shore breeze but it was a sunny afternoon in Blackpool and a more relaxed meeting with fewer people than normally attend a Mid Lancs league meeting. The events were nonetheless well contested with the sprinters in particular testing the abilities of the track judges and timekeepers with many tight finishes. Several of our athletes achieved grade 1 standards - Sierra Jalloh over 100m and 200m, Amber Hughes in both shot and javelin, Rhys Hulse in the 100m and the long jump - with perhaps the best being Amber's shot put of 10m 33. I've not actually seen Amber perform in this event but to put the shot over 10 metres must be a triumph of skill over physique! Our Under 13 Girls were Ellie Clark, Brianna Hanlon, Amber Hughes, Sahara Jalloh, Sierra Jalloh, Apphia Keenan, Jessica Keenan and Libby Simpson. This was Ellie Clark's first competition and it was an impressive debut! She ran 14.8 for 2nd place in her 100m heat, threw the javelin 13m 44 and her discus throw of 18m 32 was a grade 3 standard. More than that, in her first competition for the club, she has replaced Amber Highes' discus club record set last year! We haven't see Brianna in T&F since the club's open meeting last September. At Blackpool, she featured in the long jump with a best clearance of 3m 43. Following a slight knock in training, Amber sensibly stuck to field events and still managed to win two events. She won the shot with 10m 33 - two of her throws were over 10 metres! - and the javelin with a PB 26m 02. Her discus throw of 17m 93 was also a new PB. Sahara competed in the long jump with a best of 3m 38. Sierra won the 200m in 27.4 and was pipped on the line in the 100m to take silver in 13.3. In this fastest heat of the 100m there were 5 girls crossing the line within two tenths of a second! Apphia ran a PB 31.7 for 200m, long jumped 3m 34 and threw the javelin 14m 60. Jessica's 100m run in 14.9 was a PB and she equalled her previous best with 12.3 in the 70m hurdles, taking the silver. Finally, Libby led all the way to win the 800m race in 2:45 before running a 200m in 32.1. The girls also took silver in the 4 x 100m relay. Our Under 13 Boys were Jack Bamber, Jack Clark and Rhys Hulse. Jack B won the javelin competition with 26m 84. Jack C ran 28.3 for 200m, cleared a PB 4m 11 in the long jump and cleared 1m 25 in his first club competitive high jump. Rhys had the 2nd fastest time today in both the 100m, running a PB13.0, and the 200m in 27.2. Katy Piercy was our only Under 15 Girl at Blackpool. She ran 13.3 for 75m hurdles, just outside the medals, but more importantly threw the javelin over 30 metres for the first time - 30m 73 - a new PB and an event win for Katy. Our Under 17 Women javelin throwers Megan Howarth and Eve McMahon were in action at Blackpool. Megan took a silver medal with a best of 32m 42 and Eve is heading towards that 30 metre mark with a best of 28m 21. Our Under 17 Men were Patrick Manchester and Luke Suarez. Patrick put the shot 9m 63 and threw the discus 20m 43. Luke equalled his PB with an 11.7 run in the 100m, winning his heat on the dip to take a bronze award. Finally, Under 20 Men Harry Flanagan and Ben Apps competed here. Ben's best triple jump of 13m 29 gave him a 2nd place finish. Harry seems to be focussed on 400m at the moment and after setting a sub-50 club record at his first attempt at Whitehaven earlier this month, there was anticipation as he settled on his mark. He was quickly in the lead and even coming into the home straight looked comfortable. But its a tough race, and this showed in the final approach to the line before motivation overcame exhaustion and he finished in 49.5 - a new club record. This was achieved without any other runner pushing him and, if there is time left this season, we may well see the record go again. Thanks to today's officials: Barrie Hughes, who also stood in as team manager for the day, Emma Howarth, Mike Dandy and Dave Whitehead. 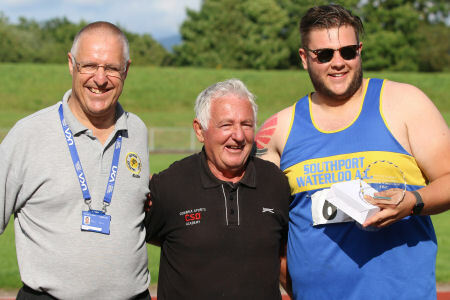 At this time of year there is rarely a weekend goes by without some form of Track & Field athletics and on Sunday it was the Warrington Open Medal Meeting at the town's Victoria Park track. Remarkably, I understand they had over 400 entries so we had a very busy afternoon, the track finishing an hour and a half behind schedule despite a very experienced and efficient Start team. With all the summer training and most of the championships over for the year, these open meetings give an opportunity for late season PBs and our 14 athletes produced 14 PBs between them. And, of course, open meetings give athletes too young for league competition a chance to show their abilities. Under 11 Hannah Keenan: a OB 11.9 for 75m, and a 2:03.6 600m. Under 11 Charlotte Hughes: 12.4 for 75m and 25.7 for 150m. Under 13 Amber Hughes: back to 70m hurdles after her injury and an excellent win in 11.5. She also won the 75m in 10.1 and the 150m in 20.4. Under 13 Jessica Keenan: two PBs from three events. long jumping 4m 06, running 12.3 for 70m hurdles and 11.5 for the flat 75m. Under 13 Lauren Byrne: 12.9 for 70m hurdles and, in the field, 6m 34 in the shot and 3m 67 in the long jump. 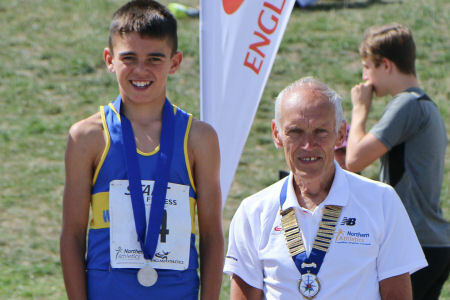 Under 13 Rhys Hulse: he ran 13.2 for a new 100m PB, 27.0 for 200m and his best long jump of 4m 83 was another PB. Under 13 Adam Byrne: also achieved two PB - 6m 30 in the shot and equalling his previous best of 1m 25 in the high jump. He also ran 16.3 for 75m hurdles. 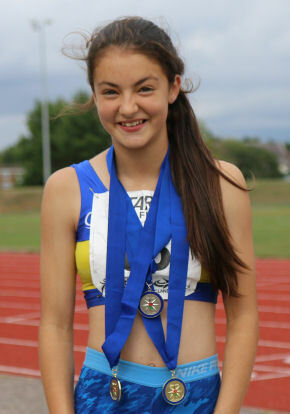 Under 15 Katie Piercy: her 4m 20 long jump was a new PB and she was 2nd in both the shot (8m 78) and the javelin (26m 32). 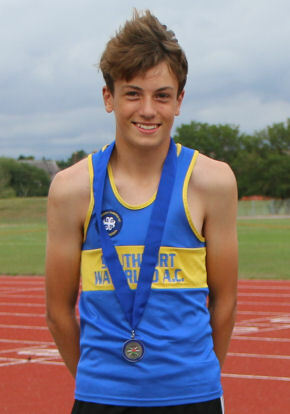 Under 15 Sam Coupland: he equalled his PB in the 80m hurdles running 12.5 and his 40.0 for 300m and 9m 93 in the shot were both new PBs. Under 17 Eve McMahon: threw the javelin 27m 90. Under 17 Ethan Harrison: ran 12.2 for 100m and 24.5 for 200m. Under 17 Drumayne Moore: ran 25.9 for 200m, a new PB, and he cleared 1m 55 in the high jump. Under 20 Darion Moore: ran 25.5 for 200m, a new PB, and 59.8 for 400m. Senior John Byrne: put the shot 7m 65, long jumped a PB 5m 03 and triple jumped 10m 17. Next weekend is the Mid Lancs T&F Medal meeting at Blackpool and the following Saturday we have our own open meeting at Litherland.. The Northern Athletics Under 13 / 15 / 17 outdoor T&F Championships were held over the weekend at the Wavertree Athletics Stadium in Liverpool. For Southport Waterloo, this must have been one of the best supported Northern Championships and most enjoyable ever with 11 junior athletes competing on Day 1 and 10 competing on Day 2. With some there both days, we had 17 in total taking advantage of Northern championships on our doorstep and they took 8 Northern medals. I think that must be a record, both in terms of participation and the medal haul. Athletics people will have differing views on athletes constantly seeking to improve times, distances and heights. But championships are ultimately about medals; about competing against peers and competing to win. Perhaps that was just as well on Day 1 because there was a headwind of around 5m/s in the home straight for much of the day so track times were nothing to write home about. Of course, experience at this level is also invaluable in progressing as an athlete. The weather in general over the weekend was not as bad as forecast and there were plenty of sunny spells with just an odd shower. So here are the highlights! On Day 1, we had Amy Bloxsome, Adam Byrne, Jack Clark, Sam Coupland, Rhys Hulse, Joe Kane, Sammy Pickerill, Katie Piercy, Stephanie Robertson, Josh Stammers and Luke Suarez competing. Amy Bloxsome competed in the Under 17 100m where she ran 14.90. Adam Byrne, an Under 13 Boy, improved his PB by 2 cms in the shot with a best throw of 6m 25 for 5th place. He also competed in the 100m heat and ran 15.76 to edge another new PB. Jack Clark, another Under 13 Boy, ran 13.97 for 2nd place in his 100m heat progressing to the final where he was 4th in 14.22. In his 200m race he was 4th in his heat in 29.83. Sam Coupland entered the 80m hurdles on Day 1 and was 5th in 12.79 after running 12.51 the weekend before in the Combined Events Champs in Manchester. Rhys Hulse, also Under 13, had a phenomenal day! He competed in long jump and finished 2nd with 4m 74, a new PB by just 1 cm! In the 200m, he won his heat in 27.94, progressing to the final which he also won in 27.75, impressing with a really strong finish. So Rhys gets his first two entries in our Roll of Honour. Joe Kane ran both Under 15 sprints. Like several others, this would have been his first Northern Championships. In the 100m he was 2nd in his heat in 12.39 progressing to the final, finishing 5th there in 12.51 in a very strong head wind. He was also 2nd in his 200m in 24.62 and 5th again in the final in 24.95. Sammy Pickerill ran 2:29.19 in the 800m race finishing in that worst of all positions, 4th; just outside the medals. Katie Piercy was a medallist. She focused on the Under 15 javelin and, going into this championships, her PB for the 500gm javelin was 26.45. During the competition, I understand she beat that old PB 4 times going on to win with a best of 29m 26.The 2nd athlete of the day for the Roll of Honour. Interestingly, 5 of the 6 girls in this competition earned PBs! Stephanie Robertson ran 13.32 for 4th place in her heat of the 100m. Josh Stammers ran in the under 15 200m and was 5th in his heat in 26.10. He made the final where he ran 26.73. He ran a 100m in 13.03 and also long jumped 5m 18. Luke Suarez ran 26.24 in his heat of the Under 17 200m. Finally, on Day 1. Marcus Bathie who runs second claim for Southport Waterloo ran a PB 62.81 in the 400m hurdles, finishing just outside the medals. On Day 2, we had Abigael Bamber, Lauren Byrne, Sam Coupland, Megan Howarth, Amber Hughes, Jessica Keenan, Katie Piercy, Niamh Procter, Stephanie Robertson and Luke Suarez. Abigail Bamber took to the Under 15 75m hurdles in less than ideal conditions with a strong headwind. She ran 13.55 in her heat (but finished ahead of the Warrington girl currently ranked 13 in the country.) Then, Abi finished 3rd in her heat of the 200m in 27.43, just qualifying for the final as a fastest loser. Her 200 final was the last race of the day and Abi ran a great bend to enter the straight as a medal contender. The finish was so close that we had to wait for the photofinish result and indeed the presentation to know that Abi had won, in a new PB time of 26.19 - nearly half a second improvement. Both 1st and 2nd were given the same time so the difference between them was in the thousandths of a second. Having seen the photo, it is clear that Abi won on the dip. Well done! 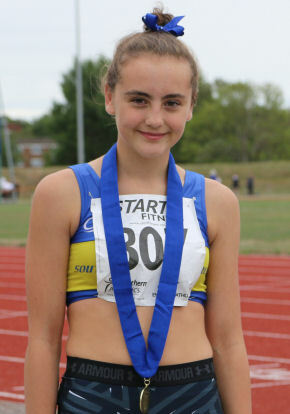 Lauren Byrne was not a medallist but she left Wavertree on Sunday with three new Under 13 PBs. In the long jump, she had a best of 3m 82, in the shot she threw 6m 89 and in the 200m she ran 31.69; all Personal Bests. Her long jump was a big PB and moved her from 9th to 3rd in the club rankings. Sam Coupland competed in the Under 15 Pole Vault on Sunday and cleared a best of 2m 75 in a very competitive field. He probably needs to get used to his new pole to make significant further progress. Sam also competed in the high jump, probably his best individual event, and cleared 1m 76 to secure the silver medal. Megan Howarth competed in the Under 17 javelin competition and had a best of 35m 43 to finish 5th. Amber Hughes ran 13.93 to win her 100m heat. In a competitive final she came 2nd in 13.61, not what she would have wanted but Amber has only recently returned to training after her serious fall at Ellesmere Port in early July and is not yet fully race fit. In the shot competition she came 1st with a best of 10m 47, not far off her 10m 66 club record. Then came the 200m and again Amber won her heat in 27.79. In the final, her competitive spirit burned bright but she had to dig deep in the last 50m to emerge as a Northern sprint champion. She ran 27.51 to end her day with three Northern medals! Katie Piercy took an Under 15 javelin medal on Day 1 and came back for the hurdles and shot on Day 2. She ran 13.49 in the 75m hurdles and she was 7th in the shot with a best of 9m 06. 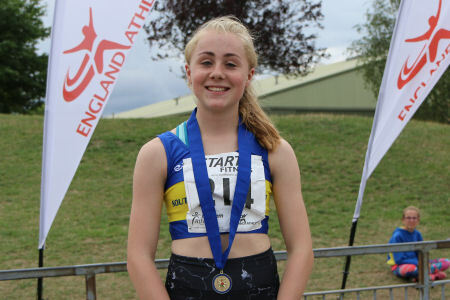 Niamh Procter competed in three Under 15 events. In heat 2 of the 100m she ran 14.83. In the 75m hurdles she ran 15.35. And in the long jump she had a best of 4m 24. Stephanie Robertson competed in the Under 17 Women's 80m hurdles. In her heat she was 3rd in 13.18 to qualify for the final where she ran a faster 13.09. Medal or not, competing in Northern championship is a great learning opportunity, competing on what was, for many, their biggest stage so far in their athletics career before some very knowledgeable spectators. Only three SWAC runners joined the record field of 192 for the Pilgrims Cross Fell race. All three runners ran well improving their times from 3 years ago when the race was last included in the Grand Prix series. The race had a tough start with a short uphill road section before joining a narrow cobbled footpath which took the runners onto the open fell for the steady climb up to Pilgrims Cross Stone for the first time. The course was quite dry which gave some good conditions for running. From the Stone the course crosses Holcombe Moor to Harcles Hill before a sharp descent and a run around the back of the hill and back across the fell before climbing up to Pilgrims Cross for the second time. After rounding the stone for the second time it was a steady climb to Bull Hill. Another steep descent followed down to join a narrow rocky path contouring around the side of the hill which eventually took the runners back to take the footpath and finally back to the road for the final run in. John Sprackland was first SWAC runner home in 48.03, followed by Brian Davey in 51.46. Carole James was the only lady from SWAC having a strong run finishing in 62.49, almost 2 minutes quicker than her previous best. With John gaining another 10 points, the men’s championship will only be decided after the last race of the series, which is at Cilcain on Monday 27th August with a 1 o’clock start. 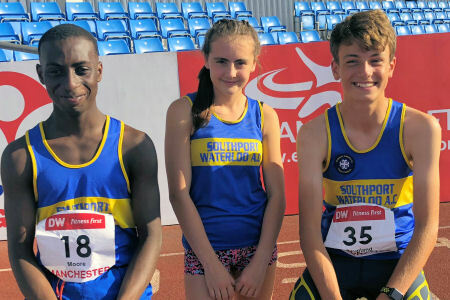 This weekend was the U15 & U17 England Athletics Outdoor Combined Events Championships with Southport Waterloo represented by Katie Piercy, Sam Coupland and Drumayne Moore at Sportscity in Manchester. The event incorporated the Northern and other Regional Championships. The weather was forecast to be nice, and the stadium turned into a sun trap for the weekend, with athletes warming up and resting within the cooler indoor facility and then emerging to do their events. These national championships are a fantastic challenge, pitting athletes against the very best from the UK, many of whom have travelled from the far corners of the country. It's also an opportunity to widen friendship groups within athletics as spending 2 days competing with the same group always leads to new acquaintances being made and true sportsmanship being shown with mutual encouragement within a very competitive event. 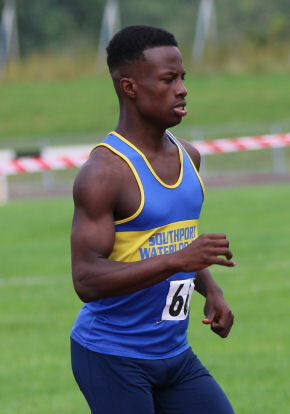 First in action on Saturday was Drumayne Moore, relatively new to competitive athletics, taking on the u17 Decathlon. With his main aim to just finish, Drumayne was a joy to observe. He conducted himself excellently, a real asset to our club. He enthusiastically set about his first day and was often seen getting advice from fellow competitors. His day one events were: 100m in 13.11s, a new PB, then a long jump of 5.54m, another PB, shot putted 8.08m a third PB in 3 events. Drumayne was disappointed with 1.59m in the high jump, a whole cm below his best, finishing day one with a 400m in 59.11s, a fourth PB, and 2,211pts overnight; good for 16th place. U15 Katie Piercy is a bit more experienced with combined events but her normal one day pentathlon was extended into a 2 day Hexathlon with the addition of the javelin for this competition, a stepping stone towards the senior Heptathlons of the future. Katie started her weekend with day one events of: 75m hurdles in 13.5s, followed by a long Jump of 3.96m and finishing with a javelin throw of 22.67m. An overnight position of 27th and 1,159pts. 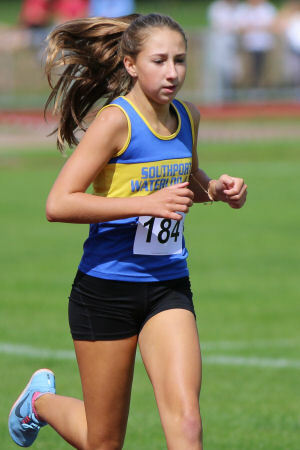 U15 Sam Coupland was the most experienced of our athletes and competed in this event last year so knew what to expect of the 8 event Octathlon. This competition was his major target for his athletic season. He has been in good form recently and was pushing to be in the medals by the end of Sunday, aiming to break 4,000pts. (last year 2,815). Saturday started with: 100m in 12.84s, a new PB, javelin thrown 30.98m and a disappointing pole vault of 2.77m; 5th place after 3 events improved by a 56.06s 400m, the second fastest of the day, for an overnight position of 4th and 1,668pts. Coping with getting rested overnight and refuelling is often difficult, and on day 2 coming back to do it all again when aching and tired is the measure of a combined event athlete. All three of ours returned for battle, some others did not. It was warmer and still. Lovely for the spectators, an increased challenge for the athletes. Drumayne's Day 2 looked if anything more challenging than Saturday, finishing with having to haul himself round the track for 1,500m. Events started with 100m hurdles completed in his own unique style in 17.98s, another PB, followed by 20.15m in the Discus. Next and his seventh event so far was Drumayne's biggest challenge, the pole vault. Having never vaulted before and only having had 4 training sessions with coaches Colin (Preston) and Kevin (Blackpool) over in Preston - Drumayne had never cleared a height in training until 4 days prior. They were not the prettiest vaults...but they were effective! Helped by the other boys, notably Ben Hughes from Wigan (who is also part of the Preston pole vault training group) Drumayne cleared the bar a number of times with his best vault being 2.47m. Javelin followed with a throw of 21.72m, another PB, and then made his way (eventually) to the starting line for the 1,500m. Starting if anything too quickly, mid race settled into a grind but finishing like a train in 5:47.18; yet another PB. 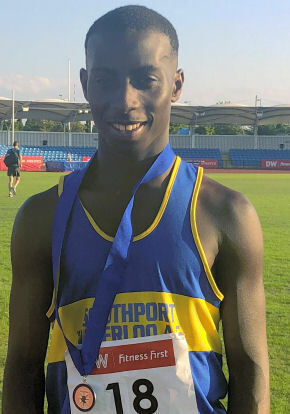 Drumayne's points total of 3,634 was good for 17th overall, a new u17 Decathlon club record, a Northern Athletics Silver medal and with it a place on our clubs roll of honour page . Katie's second day started with a smile as her first event was one of her strongest, the shot, putted 8.56m. This was followed by the high jump, a discipline Katie has struggled with since achieving her PB in Gateshead last winter. However, Katie does rise to the occasion with a leap of 1.32m her second highest jump. The 800m was all that remained and Katie was shattered. From gun to finish she dragged herself round in 3:02.67. She finished the day on 2,365pts good for 29th place overall. A new club record for this hexathlon event. Sam's Sunday turned into quite a spectacle. 4th overnight with 1688 pts, his 4,000 target looked a long way off as did hopes of a medal maybe too... His first event was the 80m hurdles in 12.51s, the second fastest of the boys and a massive 652pts just from one event, now suddenly in third place. Discus followed, all ideas of throwing safe gone as Sam threw 3 huge throws the best being 33.80m the longest of all the boys and another big points score. All of a sudden he was in second place with his best event, the high jump, to follow. High jump coach Claire was there to help Sam through his event just like she had supported him at English Schools and Sam eventually cleared 1.74m, amazingly moving him into the lead with just one event to go. It was creditable that when Sam clipped off 1.77m fellow competitor Luca Michalowski (Charnwood) was gutted for Sam, even though they were both looking to win the overall event. Luca is a fine jumper and won the high jump with 1.77m. The final event of the Octathlon is the 1,000m and Sam started this with an 8pt lead, less than a second in this race, over Aidan Brindley (North Ayrshire). Early in the race the two boys were neck and neck but a gap slowly started to appear and though Sam finished the race with a time of 2:57.2 to score his highest individual event score for the weekend and a new club record for this distance. He finished 5.4 seconds behind Aidan, deserved winner of the Gold Medal, and Sam settled for the England Silver with a points total of 4,124, a club record replacing his old mark from 2017. This England medal and his Gold for being the best of the Northern athletes also noted in the club's roll of honour page. Update 6th August: On scrutiny of results, Southport Waterloo lose 6 points which means that Seaton won the match at Whitehaven 369 to 368.5. But we are still promoted as div'l champions. 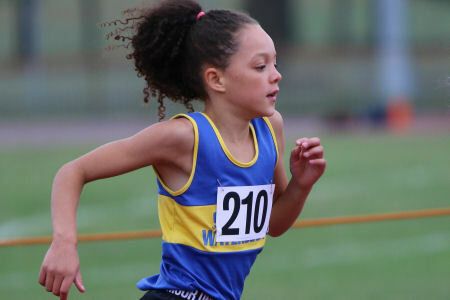 Saturday saw the final round of the Northern Track & Field League hosted by Seaton at the Copeland track in Whitehaven. Before the match there were various permutations being advanced about the possible outcome, basically because we had won two fixtures this season and Seaton, today's host club, had won one. We were very close and with Whitehaven being so far away, we might not be at our best there and host club Seaton would almost certainly turn out in strength. But if we took 2nd to Seaton, that would see us win the division. Failure to win promotion was so far an outside possibility as not to be considered. During the day, an early points score had us in 2nd place behind Seaton comfortably in 1st place but there wasn't must more indication of how things were going. So it was fantastic to hear that the announced final result was a win for Southport Waterloo. It wasn't until acting team manager Liam Harris was presented with the Divisional Champions award that the reality struck home, because beating Seaton on their home patch was so unexpected. The final scores were Southport Waterloo 374.5, Seaton 369, Kendal 341, Border 276, Burnley 198 and Pendle 178.5. So we beat Seaton by 3 League points, 23 to 20, and just 36 match points! To further underline how close this was, Seaton's men scored 184 to our 175 and our women beat Seaton 155 points to 140. We won this match because we went to Whitehaven in good numbers. It would have been easy to sent a reduced team because of the distance but this team is competitive and everyone was keep to finish the season on a high as, Divisional Champions if possible. Mission accomplished and we look forward to Division 2 next season. In terms of individual performances, I must highlight Liam Harris and Harry Flanagan who both set new club records; Liam extending his own Hammer record, and Harry who took the opportunity to run his first flat 400m and broke the Under 20 club record. In our Women's team we had Amy Bloxsome, Katy Coupland, Megan Howarth, Eve McMahon, Sarah Pickerill, Milly Smith and Olivia Taylor. These 7 athletes managed 26 event performances between them. The only event win they had was the 4 x 100m relay where Amy gave them a lead on the first leg that was held by Eve and then Katy and extended by Megan in the final 100m. Elsewhere, the women put in maximum effort and were rewarded, not just by a match win but with 12 PB performances. Sarah ran a 100m in a PB 16.8. Her 800m time of 3:49.9 was another PB, her 3m 73 long jump yet another PB and she threw the discus 16m 83. Milly, who just seems to improve with every competition, also had three PBs. She ran a PB 77.8 for 2nd place in the 400m hurdles, 19.8 for 2nd place in the 100m hurdles and 30.3 for 200m. She cleared 4m 19 in the long jump, another PB, and 1m 35 for 2nd equal in the high jump. Katy is the backbone of this women's team and she competed in the maximum 7 events. Her two hurdles races were new PBs - 111.9 for 400H and 28.2 for 100 - and she equalled her high jump PB of 1m 10 to take the 2nd 'B' points. In the field, she threw the hammer 17m 06, the discus 28m 68 for 2nd place, and the shot 7m 31 before finished on the3rd leg of the 4 x 100m relay. The Women's team included four Under 17s. Amy ran a 14.4 100m and 31.6 400m before leading off the relay. Olivia ran 2:58.4 for 800m before running a PB 71.5 for 400m. Eve, in her first 400m race, ran 68.4 to win the 'B' race - which is no surprise to those of us who see her training on the track at Litherland! In more familiar territory, Eve's 27m 65 for the 600gm javelin was a PB to again take maximum 'B' points, and she put the 4 kg shot 6m 76. And Megan was 2nd in the javelin with 31m 11, another PB, and 3rd in the hammer with 21m 85. Finally Sarah, Milly, Megan and Olivia finished off their day with the 4 x 400m relay, Milly running the fastest split of 71.0! Our Men's team comprised Ben Apps, Graham Boreham, Chris Burgess, Harry Flanagan, Liam Harris, Ethan Harrison, Barrie Hughes, Darion Moore, Jack O'Neill, Martin Smyth, Luke Suarez, Michael Taylor and Alex Waddelove; a 13- strong team, 4 more than we had at Burnley in July! All the men did well to generate the necessary team points but three stand out in terms of performance. With Lee Coupland in Manchester supporting Sam in the England Combined Events Champs, Liam took on the team manager role on the day; and led from the front. In the very first event, he improved his club record with a win in the Hammer competition launching it out to 43m 33. But he wasn't done yet. In the discus he threw a Season's Best 28m 72 for 2nd place and he won the shot with another Season's Best of 11m 40. In no particular order, my next outstanding athlete was Under 20 Harry Flanagan. He won the 100m effortlessly in 11.0, saving himself for an attempt at the 400m distance. Not having raced that distance before, be ran the 'B' race where there really was no-one in the same class . 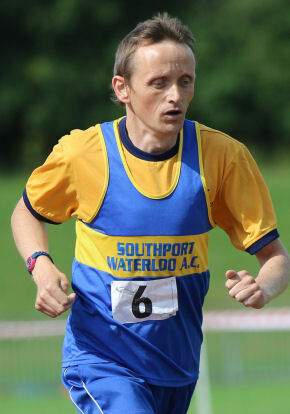 He crossed the line in 49.8 secs, a new Under 20 club record and only the 2nd Southport Waterloo runner to run under 50 secs for the distance, the other being senior runner Peter Lloyd-Jones, 49.0, in 2000. The third athlete I would single out is Alex Waddelove, in his first League appearance since moving back to the area and re-joining the club. Alex started with the 30000m steeplechase which he won in 11:19.2. He then ran a 1500m, finishing 3rd in 4:58, before toeing the line for the 5000m, running that in 18:46.7. A magnificent contribution to team performance. There were several PBs in the Men's team. Ben ran a PB 11.6 for 100m and he won the triple jump with 13m 12. Ethan ran a PB 24.4 for 200m, long jumped a PB 4m 99 and he high jumped 1m 50. Jack ran 25.3 for 200m. 12.3 for the non-scoring 100m and his javelin throw of 30m 72 was a new PB. Graham started his day in an unfamiliar event, filling in as the 'B' competitor in the hammer. His best was a creditable 14m 09. Back on the track, he ran 2:11.5 for the 800m before taking 3rd place in the 'A' 400m race in 54.6.With younger, faster sprinters in the team, Chris Burgess was mainly in the field, putting the shot 7m 96, throwing the javelin a Season's Best 30m 56 and triple jumping 7m 25. He did run the non-scoring 100m but pulled up with a painful muscle twinge that kept him out of the 4 x 100m relay. Darion ran an 800m in a PB 2:21.2 and he long jumped 3m 73. There were several new male members of the team. Hurdles and combined events coach Barrie Hughes took on the 400m hurdles. He got around in 88.8, despite hammering a hurdle, 23 years after his last hurdles race! He also took part in the discus with a best of 18m 97. Michael Taylor - Olivia's dad - donned a club vest for the first time and ran in both the 1500m, in 5:24, and the 3k steeplechase where he won the 'B' race in 13:37. 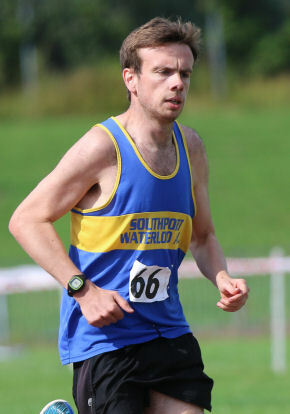 Finally, new member Martin Smyth came along for a run in the track 5000m. He completed that in 19:42.3. That's faster than the 20:35 he ran on the roads at Halewood in June. We won the Men's 4 x 100m relay in 44.8. The Senior club record is 44.6 but I don't think we had any seniors in today's team. In the 4x 400m relay Luke had the fastest split of 54.5. THe team finished 3rd in 3:42. We need to thank Team Manager Lee Coupland who has moulded this team and led them to another promotion. Thanks to our Officials: Dave Whitehead, Steve James, Steve Boreham, Emma Howarth, Ann Dignan, Christopher Henders & Mr Bloxham. The first of the late season's Open Track & Field meetings was put on by Merseyside County AA at Wavertree on Wednesday evening. It was well attended with Southport Waterloo well represented in the medals. Although a county open meeting, entry was not restricted to Merseyside athletes but in fact there were very few non-Merseysiders there, perhaps the evening start time made it difficult for those travelling from further afield. The weather was overcast, dry with a light breeze but looking at the results it was clearly difficult for athletes, particularly those competing on the track, to perform to PB level. Our 21 young athletes managed 7 PBs from 46 performances, just three on the track..
Renee Adams won her time trial in the 75m with 12.2, good enough to take a joint silver medal. She ran 24.8 for 150m, 2nd in her race and 3rd overall, and ran 2:03.3 for 600m. Charlotte Hughes ran 12.7 for 75m, 25.5 for 150m and she cleared 2m 90 in the long jump. Hannah Keenan narrowly improved her 600m PB running 2:02.6 and she long jumped 3m 21 for a 3rd place medal. Joseph Wake ran 12.0 for 75m, 1:52.8 for 600m, taking a hefty chunk off his PB, and winning the silver medal, and he threw the soft javelin 12m 76. Harry Williams ran 12.7 for 75m, 25.1 for 150m and he long jumped 2m 77. William James ran 13.8 for 75m, and he long jumped 2m 57. Amber Hughes was back to competitive form and left with three gold medals. She ran 10.4 for 75m, put the shot 9m 75 and threw the javelin 25m 28. Jessica Keenan won the 70m hurdles in a PB=equalling 12.6 to take a gold medal there. In the flat 75m she was 3rd in her race in 11,9, and a 3rd place finish in the long jump with a new PB of 3m 98, gave her a 2nd medal. A good evening's work for jessica! Elizabeth Wake ran 2:46.9 for 800m and 23.6 for 150m, finishing 3rd in her race. Jack Bamber won the javelin with 27m 70. Jack Clark was 2nd in the javelin with a best of 26m 57. He ran 14.2 for 100m - 2nd in his race and taking the silver medal overall - and ran 28.9 for 200m, for 2nd to take another silver medal and his third for the evening!. Abigael Bamber took three medals winning the 100m in 13.6, winning the 75m hurdles in 12.4 secs and taking 2nd place in the 200m in 27.3. Katie Piercy ran 14.4 for 100m and took two gold medals in her field events, winning the shot with 8m 62, and the javelin, with 23m 59. Niamh Procter achieved a PB in the high jump, clearing 1m 38, for a gold medal. She long jumped 4m 06 and ran 15.3 for her sprint hurdles race. Hannah Williams ran 15.7 for 100m and long jumped 3m 77, a new PB. Eleanor James took the silver medal in the 800m crossing the line in 2:41.9. Joseph Kane was 2nd in the 100m in 12.0 and 3rd in the 200m in 25.1 so two silver medals for him. Lauren Lewis won both the 100m in 13.5 and the long jump with a best of 5m 04, so took two gold medals. Megan Howarth won the javelin with 31m 72 for the gold medal. Eve McMahon was 2nd in the javelin with 29m 21, a new PB, and won her the silver medal. Luke Suarez ran the 100m in 12.6, finishing just outside the medals but given the same time at the bronze medallist.